Elmyr Pauline Henderson, 93, of Gray, returned to her heavenly home, Tuesday, April 2, 2019. Funeral services will be held Sunday, April 7, 2019 at 3:00 PM with Pastor Jason Dillard officiating. The family will receive visitors from 2:00 PM until 3:00 PM. Burial will follow the service at the Clinton United Methodist Church Cemetery. The family gratefully requests that, in lieu of flowers, please consider a memorial donation to the Clinton United Methodist Church, 110 Old Highway 18, Gray, Georgia 31032. The family may be contacted at 2924 Graham Road, Gray, Georgia. Elmyr was born to the late Claude and Bertha Roberts in Wayside, Georgia on January 27, 1926. She graduated from Jones County High School and continued her education by becoming a licensed cosmetologist. She owned and operated a beauty salon in downtown Macon for approximately 30 years. 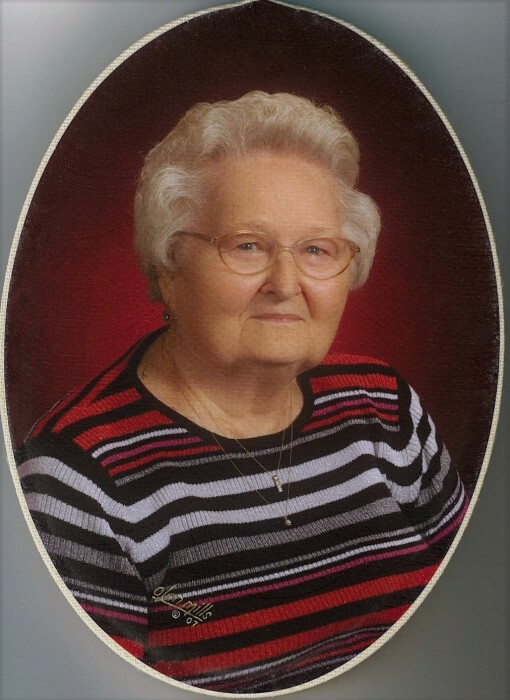 She was a devoted member of Clinton United Methodist Church - since 1951. Elmyr taught children’s Sunday School for many years and sang in the Vintage Singers Choir. Elmyr loved to garden and work on crafts. She volunteered for Bibb County’s Cherry Blossom Festival for approximately 13 years and was an avid member of the Gray Garden Club, Methodist Women in Missions, Woodman of the World, and Relay for Life. Elmyr is preceded in death by her husband, Clio Lynn Henderson; brother, Leonard Roberts; and sisters, Lillian Garrett, Maudlyn Meldrim. Elmyr was blessed with a large and loving family. She is survived by her sister, Ruby Turk of Gray; nieces and nephews, Ronald Garrett (Linda), Wayne Garrett (Cynthia), Victor Garrett (Debbie), Mary Ellen Holland (Claude), Michael Roberts (Carla), Jennifer Locklear (Hal), Pauline Ryles (Joey), Darrell Turk (Teresa), and Donna Ingram (Lloyd). The family would like to recognize Tomekia Briscoe and Gaynell Hardwick for their services. Hart’s Mortuary, Jones County Chapel have charge of arrangements.